[...]In today’s post I will present the background to the development of the five essential elements and in Part II, I will go through the remaining elements. First a word about Stephen Martin; for those of you who do not know Stephen Martin, he has a long and distinguished legal and compliance career. He was at the Department of Justice (DOJ) and then moved in-house, helping some of America’s largest companies to wade through major corporate scandals. He was most recently the General Counsel (GC) at Corpedia before heading into private practice at Baker & McKenzie. He has been around the (compliance) block more than once and I can assure you that he knows his FCPA compliance stuff. He is certainly one of the practitioners that I would go see to make a FCPA compliance presentation. Extensive pre-retention due diligence on business partners and stringent controls on payments to business partners. 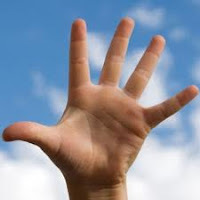 The five essential elements of a corporate compliance program are based upon the best practices as set out in the seven elements of a corporate compliance program under the US Sentencing Guidelines; the 13 Good Practices by the OECD on Internal Controls, Ethics, and Compliance; and the UK Bribery Act’s Six Principles of an Adequate Procedures compliance program. The following chart lists the elements of each. Leadership – color coded Red. Risk Assessment – color coded Yellow. Standards and Controls – color coded Blue. Training and Communication – color coded Green. Oversight – color coded Grey. The point means more than simply “Tone-at-the-top”. A successful compliance program must be built on a solid foundation of ethics that are fully and openly endorsed by senior management; otherwise the program may amount to little more than a hollow set of internal rules and regulations. There should be an unambiguous, visible and active commitment to compliance. But even more than support or the right tone, compliance standards require that companies must have high-ranking compliance officers with the authority and resources to manage the program on a day-to-day basis. And compliance officers must have the ear of those ultimately responsible for corporate conduct, including the board of directors. Some of the questions you might think about in connection with the leadership of your compliance program are the following: How is board oversight implemented? Is there an ethics or audit committee reporting to the full board? What is the role of the Chief Compliance Officer? What is the role of the General Counsel? How do the legal and compliance departments interact? Does the CCO have “real power”? Is she or he treated as a second-class citizen? Once Board knows of a potential compliance issue it must act. Regularly receive compliance briefings and training. I think everyone agrees and understands that the Chief Compliance Officer (CCO) is a key, if not the key, role in a company’s compliance program. Some of the important indicia of a CCO are that they are high ranking within the company and are dedicated to compliance and responsible for day-to-day management and oversight of compliance program. The position should have direct access to the Board or appropriate Board committee and the Compliance Department should be provided sufficient resources to achieve its goals. In addition to the role of the CCO, there should be compliance officers in high-risk markets who regularly communicate with managers in the field because country and/or regional managers are often the employees in the trenches who are responsible for overseeing sales people and third-party agents who are producing, selling and distributing the company’s products and services. Lastly, local managers are often in the best position to set the tone for compliance and to detect and address illegal or unethical practices before they become issues that put the company at risk. The implementation of an effective compliance program is more than simply following a set of accounting rules or providing effective training. Compliance issues can touch many areas of your business and you need to know not only what your highest risks are but where to marshal your efforts in moving forward. A risk assessment is designed to provide a big picture of your overall compliance obligations and then identify areas of high risk so that you can prioritize your resources to tackle these high risk areas first. Country Risk - What is the correlation between growth markets and corruption risk and what is the perceived level of corruption? In other words, the Transparency International Corruption Perceptions Index or similar list. Sector Risk - Has government publicly stated industry is under scrutiny or already conducted investigations in sector? Are there corruption risks particular to the industry? Business Opportunity Risk - Is the business opportunity a high value project for your company? Are there multiple contractors or intermediaries involved in the bidding or contract execution phase? Business Partnership Risk - Does this business opportunity require a foreign government relationship? Does a foreign government require you to rely upon any third parties? Transaction Risk - Will your company be required to make any “compelled giving” through any requirements for political or charitable contributions? Are you required to use any intermediaries to obtain licenses and permits? In addition to an initial risk assessment to either (1) inform your compliance program or (2) help you to identify high risks and prioritize their remediation, risk assessments should be a regular, systemic part of compliance efforts rather than an occasional, ad hoc exercise cobbled together when convenient or after a crisis. These should be conducted at the same time every year and deputize a consistent group, such as your internal audit department or enterprise risk management team, to conduct the annual review. Such annual risk assessments act as a strong preventive measure if they are performed before something goes wrong. In addition, enforcement trends and government priorities change rapidly so it is vital to stay up to date and conduct regular assessments. Lastly, it avoids a “wait and see” approach. Risk assessments should also be used to scrutinize new business partners and third-party agents. The majority of FCPA/anti-corruption investigations and enforcement actions involve some use of third parties, including consultants, distributors, contractors and sales agents. By conducting a formal risk assessment each year it provides an opportunity to take a closer look at recently-established business relationships to make sure partners and third parties do not have improper connections to government officials or some involvement in unethical or illegal conduct. Additionally conducting such a risk assessment allows your company to proactively address and remediate any risks that are uncovered. Stephen Martin and the Baker & McKenzie team have put together an excellent resource for the compliance practitioner in their five essential elements of a corporate compliance program. I hope that you can attend our FCPA event next week. For those of you who cannot attend in person, you can email me for the slide deck and other materials after the event. Generally, every company has three levels of standards and controls. (1) Code of Conduct. Every company should have a Code of Conduct which should express its ethical principles. However, a Code of Conduct is not enough. (2) Standards and Policies. Every company should have standards and policies in place that build upon the foundation of the Code of Conduct and articulate Code-based policies, which should cover such issues as bribery, corruption and accounting practices. (3) Procedures. Every Company should then ensure that enabling procedures are implemented to confirm those policies are implemented, followed and enforced. FCPA compliance best practices now require companies to have additional standards and controls, including, for example, detailed due diligence protocols for screening third-party business partners for criminal backgrounds, financial stability and improper associations with government agencies. Ultimately, the purpose of establishing effective standards and controls is to demonstrate that your compliance program is more than just words on a piece of paper. Another pillar of a strong compliance program is properly training company officers, employees and third parties on relevant laws, regulations, corporate policies and prohibited conduct. Simply conducting training usually is not enough. Enforcement officials want to be certain the messages in the training actually get through to employees. The Department of Justice’s (DOJ) expectations of effectiveness are measured by who a company trains, how the training is conducted and how often training occurs. There are several key elements to training. First is that you need to train the right people. You must prioritize which audience to educate by starting your training program in higher risk markets and focus on directors, officers and sales employees who may have direct contact with government officials or deal with state-owned entities. Again, focus initially on training country managers in your company’s high-risk markets, then expand geographically and through the ranks of employees. Second, in high risk markets and for high risk employees or third parties you should conduct live, annual training. Enforcement officials have made it clear that live, in-person training is the preferred method in high-risk markets and also that it should be regular and frequent. Another benefit of live training is the immediate feedback from employees that would be much less likely to occur during a webinar or other remote training. Lastly, during live training, employees are more likely to make casual mention of a potentially risky practice, giving you the opportunity to address it before it becomes a larger problem. It is important that you pay attention to what employees say during training. This is because training can alert you to potential problems based on the type of questions employees ask and their level of receptiveness to certain concepts. For example, during training employees might ask specific questions about important compliance considerations such as their interactions with government officials or gift-giving practices. Such questions can raise red flags and uncover issues that should be reviewed and addressed quickly. Thirdly, you should tailor your training to each country. This means that employing a generic script for compliance training is a mistake. To be effective, training programs should be customized by region, country, industry, areas of compliance and types of employee. In addition to Foreign Corrupt Practices Act (FCPA), UK Bribery Act, and OECD guidelines, focus on compliance risks in the country where the employees being trained are working. For example: In China, address the many corruption risks involved in dealing with state-owned entities. The issue your company should focus on here is whether employees are staying with the compliance program. Even after all the important ethical messages from management have been communicated to the appropriate audiences and key standards and controls are in place, there should still be a question of whether the company’s employees are adhering to the compliance program. Two of the seven compliance elements in the US Sentencing Guidelines call for companies to monitor, audit and respond quickly to allegations of misconduct. These three highlighted activities are key components enforcement officials look for when determining whether companies maintain adequate oversight of their compliance programs. Many companies fall short on effective monitoring. This can sometimes be attributed to confusion about the differences between monitoring and auditing. Monitoring is a commitment to reviewing and detecting compliance programs in real time and then reacting quickly to remediate them. A primary goal of monitoring is to identify and address gaps in your program on a regular and consistent basis. Auditing is a more limited review that targets a specific business component, region or market sector during a particular timeframe in order to uncover and/or evaluate certain risks, particularly as seen in financial records. However, you should not assume that because your company conducts audits that it’s effectively monitoring. A robust program should include separate functions for auditing and monitoring. While unique in protocol, however, the two functions are related and can operate in tandem. Monitoring activities can sometimes lead to audits. For instance if you notice a trend of suspicious payments in recent monitoring reports from Indonesia, it may be time to conduct an audit of those operations to further investigate the issue. Your company should establish a regular monitoring system to spot issues and address them. Effective monitoring means applying a consistent set of protocols, checks and controls tailored to your company’s risks to detect and remediate compliance problems on an ongoing basis. To address this, your compliance team should be checking in routinely with local finance departments in your foreign offices to ask if they’ve noticed recent accounting irregularities. Regional directors should be required to keep tabs on potential improper activity in the countries they manage. Additionally the global compliance committee should meet or communicate as often as every month to discuss issues as they arise. These ongoing efforts demonstrate your company is serious about compliance. Finally, as was emphasized again with the recent Pfizer Deferred Prosecution Agreement (DPA), your company should establish protocols for internal investigations and disciplinary action. The Pfizer “Enhanced Compliance Obligations” included the following on investigative protocols: (a) On-site visits by an FCPA review team comprised of qualified personnel from the Compliance, Audit and Legal functions who have received FCPA and anti-corruption training; (b) Review of a representative sample, appropriately adjusted for the risks of the market, of contracts with, and payments to, individual foreign government officials or health care providers, as well as other high-risk transactions in the market; (c) Creation of action plans resulting from issues identified during the proactive reviews; these action plans will be shared with appropriate senior management and should contain mandatory remedial steps designed to enhance anti-corruption compliance, repair process weaknesses, and deter violations; and (d) a review of the books and records of a sample of distributors which, in the view of the FCPA proactive review team, may present corruption risk. Prior to such an investigation, however, the company should have procedures – including document preservation protocols, data privacy policies, and communication systems designed to manage and deliver information efficiently – in place to make sure every investigation is thorough and authentic. Finally, and consistent with Stephen Martin’s Baker & McKenzie partner Paul McNulty’s Maxim Three (What did you do about it? ), is your remediation efforts. Your company should remediate problems quickly. A key concept behind the oversight element of compliance is that if companies are policing themselves on compliance-related issues, the government won’t have to do it for them. Remediation, then, is an important component of oversight. If your company’s sales force in Thailand is engaged in potentially improper activity due to a lack of adequate training, remediate the deficiency and schedule that training now. In the end, it’s not enough to just gather information and identify compliance problems through monitoring and auditing. To fulfill this essential element of compliance, you also have to respond and fix the problems. 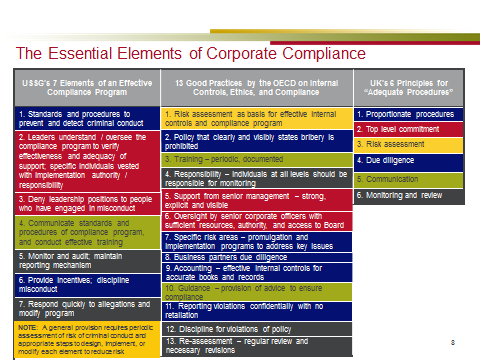 Stephen Martin and the Baker & McKenzie team have put together an excellent resource for the compliance practitioner in their five essential elements of a corporate compliance program. I hope that you can attend our FCPA event this week. For those of you who cannot attend in person, you can email me for the slide deck and other materials after the event.